Regeneration is a common phenomenon among animals. Members of the phylum Arthropoda, comprising over 80% of total animal species, exhibit strong capacities for regeneration, but little is known about the molecular mechanisms mediating this process. In this study, we investigated the role of the activin signaling pathway in limb regeneration in the decapod crustacean Procambarus fallax f. virginalis. We identified and cloned a downstream transcription factor in the activin pathway, Smox. The Smox gene showed 3 splicing variants, but only one of them encoded a complete Smox transcription factor. Gene knockdown of Smox by RNAi induced formation of smaller limb buds and regeneration of complete but smaller pereopods after autotomy. This indicates that activin signaling via Smox functions in regulation of pereopod size. The expression levels of both Smox and the activin receptor babo were closely correlated with molting. The expression level of Smox during the molting cycle increased when the receptor babo was knocked down by RNAi, indicating that Smox and babo transcription are linked. Our study suggests that the Babo-Smox system in activin signaling is conserved in decapods, and supports an evolutionary conservation of this aspect of molecular signaling during regeneration between protostomes and deuterostomes. Marbled crayfish (Procambarus virginalis) are the only freshwater crayfish known to reproduce by cloning (apomictic parthenogenesis). Notably, among genetically identical offspring raised in the same environment, distinct phenotypic differences can be observed. These unique characteristics establish the marbled crayfish as a particularly interesting laboratory model. 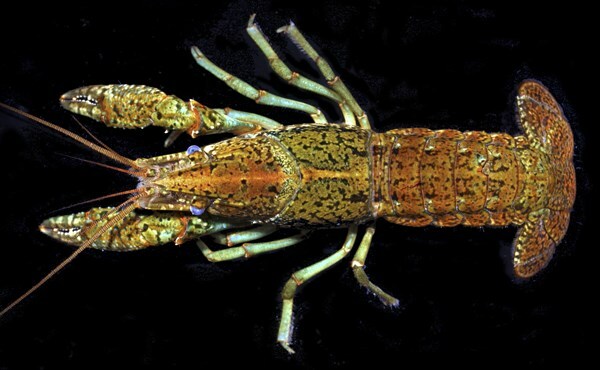 Additionally, parthenogenetic reproduction enables the marbled crayfish to rapidly spread and form stable populations, which poses a serious threat in many freshwater habitats. A further understanding of this organism requires the accessibility of its 3.5 Gbp large genome sequence. This doctoral thesis provides the first de novo genome assembly of the marbled crayfish. Multiple shotgun and long jumping distance libraries were generated from one individual female, with a single base coverage of over 100×. Sequencing data was used for a first genome assembly with a length weighted median scaffold size (N50) of over 40 kbp. The estimated genome wide heterozygosity rate of 0.53% is substantially higher compared to other arthropod genomes. Transcriptome data enabled the refinement of genetic structures. Eventually, a total of 87.8% complete and 7.4% fragmented single-copy arthropod orthologs were identified using the benchmarking software BUSCO. Single nucleotide variations were analyzed to verify clonality in geographically isolated populations. Results indicate an evolution from a single origin. Moreover, detailed insights into genotype distributions support the theory of asexual speciation by autopolyploidization. Comparison of three Procambarus species indicates detectable genetic separation between marbled crayfish and the closest relative Procambarus fallax. Automatic annotation of 21,000 genes using the annotation pipeline MAKER provides a detailed overview of genetic features. For example, a cellulase gene was identified which potentially plays a key role in omnivorousness. Genomic data and several online services are provided by a central web resource. This thesis provides detailed genetic insights into the unknown but very versatile order of decapod crustaceans. Considered economically and ecologically relevant keystone species, a representative genome sequence provides an important resource for future research. Their page on Marmorkrebs is generally very thorough! Their distribution map seems a little out of date, and has a couple of oddities. For instance, there is one dot right in the middle of the continental United States (roughly in Kansas or Nebraska). This is supposed to represent that Marmorkrebs are available in the pet trade throughout the country, and cite Faulkes (2010) as a resource. Strangely, that paper also found Marmorkrebs for sale as pets in Canada... but there is no dot on the map for Canada.